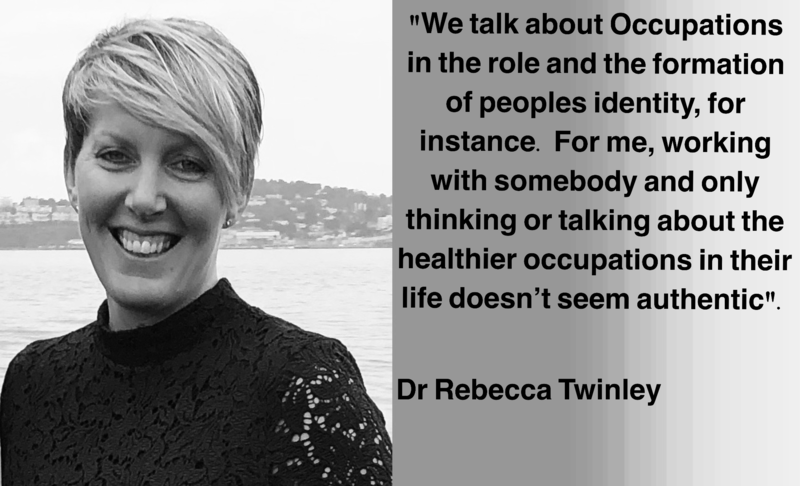 Dr Twinley came into my life, as many have, via online connections and shared thoughts on Occupation and Occupational Therapy. When we first connected was just before she publicly released the concept of The Dark Side of Occupation. This concept very easily resonated with me. It integrated into my clinical practice and conceptualization very easily. It just made sense. The understanding that occupations having purpose and meaning, being contextually situated and having an impact on health are nothing new to OTs. Reflecting on “the dark side” of occupations and seeing that there are many people in society, you included, who engage in maladaptive, harmful or health decreasing occupations was profound. It’s something, that for many, doesn’t seem to have been given the focus it deserved until it was given a name. Since this time I’ve seen the concept spread and evolve and become more widespread. One thing I’ve seen is the evolution of how people used the term. It was good to get Bex’s opinion on this and how it differs from her understanding and presentation of the concept. It’s incredibly important that Occupational Therapists not only look at occupations that are health promoting but also those that may not have such a positive impact. Only then are we able to fully gain an adequate understanding of the people we work with and deliver effective health services. If you are wanting to get a better understanding of the concept then definitely start with the website linked below.